On the way back to GP we stopped off in Kelowna to visit the brand new H2O Activity & Fitness Centre. 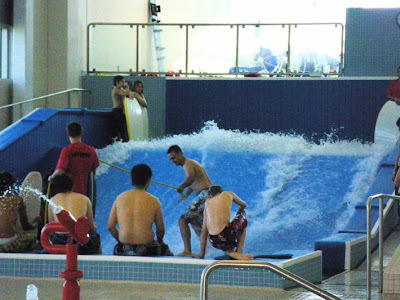 Of course with our new aquatics centre under construction it's worth while to visit any new facility for ideas but this one is special; it has Canada's first FlowRider... Grande Prairie will have Canada's second. 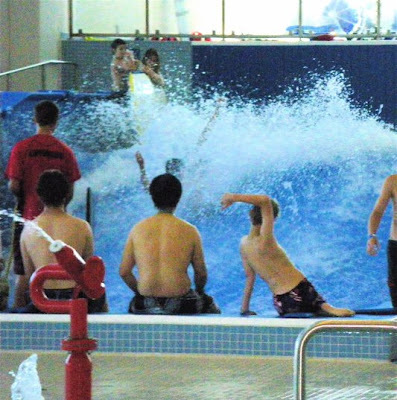 I lobbied hard to have the Flowrider included in the facility because I felt that it would add a unique, active, element to the building. I thought that it would be just the thing to attract the "15 - 20 yr old skateboard/snowboard kids" who I feel are kind of missed by the other pool elements we had in the design. On top of all that I think it has a good opportunity to be a revenue generator for the facility. After trying it and seeing who was using it - I'm pretty confident that it will tick off all those points above. 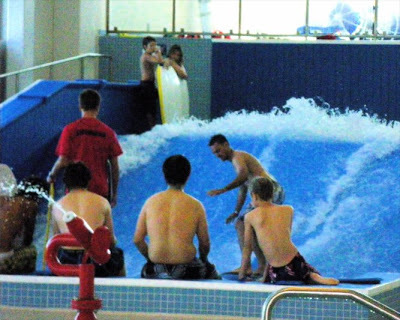 The use of the FlowRider was included in my drop in fee of $9.50 (non-member price) but since we were just making a quick detour and I wanted to get a lot of rides in a short period I also bought another band that allowed me to go approximately once for every four or five normal riders. That was an additional charge of $10. Here's body-boarding. To get on you enter from the top of the wave. ... confident enough to let go of the rope and managing pretty well! All in all it was a VERY fun time and I think the FlowRider is going to be great in GP! 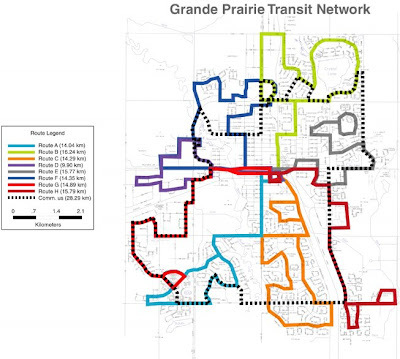 Draft Transit Master Plan - New Bus Routes! At the public works committee today there was a presentation on the draft Transit Master plan. I wasn't at the meeting but I received the plan ahead of time in my council mail box. • Operational hours will be extended to 6:20am to 10:00pm M-F, 10:00am to 6:00pm Saturdays and 10:30am to 5:00pm Sundays. • Service frequency will now be 40 minutes on all routes and every 20 minutes on selected routes during peak times. • New routes will be established to connect to pretty much all subdivisions of the city. (see the rout map below). There also a lot more in the plan; a downtown transit terminal, standards for bus stops and the possibility of linking up with the school system to replace the yellow busses for high school students. (The document is about 100 pages long) as soon as it's up on the city's website I'll post a link to it here - or in the mean time if you're interested email me and I'll send you the pdf. So this is great progress but there is still some work to do as each of the recommendations / ideas in the plan require resources and that means money. "The MDP is the overarching document that guides all the other plans that the city does so it's principles have a big impact in how our community develops. In fact it literally shapes the way our neighbourhoods grow, mature and redevelop - so it has a big impact on our quality of life." There have been lots of input sessions and open houses since then and there is now a draft version of the new plan available. If you take a moment to check it out you'll notice that it highlights things such as; more respect for the pre-existing natural environment when new neighbourhoods are developed, increased focus on sidewalks and walkable communities as well as bike paths, direction to develop a 20 year economic development vision, and standards that will yield more attractive commercial development. That's just a few of the high points. To see the detail check out the full version of the draft plan HERE. Check out the "easy reading" version in the promotional flyer HERE. Read either version and send me your comments, positive and/or negative. A special thank you to Michelle Gairdner and the others who worked so hard preparing and staging such a wonderful grand opening of the Montrose Cultural Centre. Thank you to the City of Grande Prairie for providing this new library for the community. The public response has been wonderful. The tutoring room is being booked, memberships are up 230%, and the public has found their favourite corners to curl up with a book by the window or study in a quiet area with a cup of coffee or use the public computers. Teens love their new area for studying and visiting with friends. The parents and young children love moving the cushions and bean bag chairs into just the right position for lounging and sharing a good book. Join us for the Grand Opening of the Grande Prairie Public Library! The festivities will begin on Saturday, August 22 at 10:00 am. There will be activities for the whole family including performers and special story times as well as coffee, juice and snacks. Opening ceremonies will be at 3:00 pm in the Teresa Sargent Hall. There will be giveways for the first 500 visitors. Enter to win fantastic prizes including a Wii! Why should the kids have all the fun? Discover the latest summer reads at your Library and win prizes. Keep track of the books you read or listen to between July 2 and August 31. Read 3 books or listen to 3 books (tape, CD or downloadable eAudiobook) and be eligible for weekly prizes. After reading or listening to six books, complete your reading log and enter your name for the Booklover's basket to be drawn in September. Reading logs are available at Customer Services or online. We are now able to offer Group Computer Training for the public in our new Training Lab. Registration is required. Maximum of 10 participants. Join the TD Summer Reading Club this summer! Plan to visit the Library this summer for detective themed events including our new online summer reading club at www.gppl.ab.ca. Presented by members of the community. 10:30 am - 11:00 am - Musical Tots: stories rhymes and music for 2 and under. 7:00 pm - 8:00 pm - Family Night: Bingo, Booknik (book sharing and snacks), scavenger hunt & games. 10:30 am - 11:15 am - Storytime: stories, finger plays and films for 3 to 5 year-olds. Enjoy popcorn, refreshments and a movie. Which was better? The book or the movie? Discuss and defend your choice! Thursday, July 23 @ 6:30 pm - The Three Musketeers based on the book by Alexandre Dumas. Thursday, August 20 @ 6:30 pm - Carrie based on the book by Stephen King. Visit the Information Desk to sign up for your one-on-one instruction with Library staff. Call (780) 357-7455. This is my first post after being out of the city for a while on a short summer vacation. I did manage to squeeze in the "council related activity" I mentioned and I'll be posting pictures soon. Today is a "Council Monday" so we will have our full regular meeting tonight at 7pm. I was going to post the agenda for that but it doesn't seem to be online this morning. So, in it's place I'm getting a little head start on the week and posting the Agenda for the General Government Services committee meeting that will happen on Wednesday. The names you see below the agenda items are the staff members who are presenting the report on that item. My quick comments are in italics. This bill from the province calls for the creation of a Municipal Auditor. Not a bad idea but 1) it has the potential to create a lot of additional work for municipalities and 2) the Minister of Municipal Affairs already had the power to order municipalities to under go an audit. Along with Bill 203 I think it's an example of a private member's bill that addresses a perceived problem rather than an actual one. Both pieces of legislation have their good points but I think they went ahead without a lot of research being done. For example I don't think either AUMA or AAMD&C (the organizations representing Alberta municipalities) were consulted in the creation of these. Janette is bringing this bill to council's attention (I first heard of it this spring on Twitter) and I imagine that the committee will ask for a report on how this will impact the city. We may also take a position forward to AUMA asking them to lobby the province for changes. Looking on Twitter I just noticed that the Province is asking for public input on the Bill, I imagine we'll as staff to prepare a submission. On a somewhat related note; I think it's odd the province wants to create more auditor positions when they don't even fund the one they already have. This report formalizes the process of doing Customer Satisfaction survey's in the city every 2 years. The next one would be in March of 2011. Having it then will allow the new council (elected in October of 2010) to use the input from residents as they build their strategic plan in the spring of that year and the 3 year budget in the fall. It's a great feedback loop that will ensure that the views of residents are reflected in the city's business planning process. This is an annual grant, and it's one of the few that comes without strings attached, like saying it has to be used by a certain time, or for a certain type of project or service. The total amount of the grant this year is $592,188 or approximately 0.00422 % of our yearly budget. In this letter they are inviting the Mayor to attend to help celebrate at their Opening Ceremonies on Friday September 4th. The weekend of the 4th to the 7th the Town will be hosing a Homecoming celebration for everyone who ever lived in Grande Cache - mark it on your calendar! 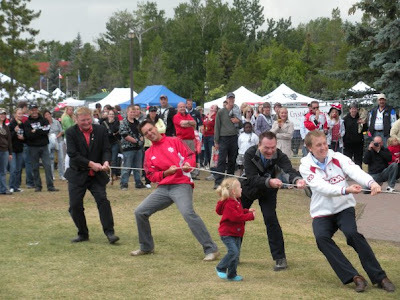 Canada Day Celebrations, Tug-o-War; Kids vs. Politicians. Left to Right: MLA Wayne Drysdale, Myself, Mayor Dwight Logan & MP Chris Warkentin.... we lost... pretty badly. Thanks to Tymmarah in MLA Drysdale's office for snapping the pic. Summer is here and I'm going to be taking a little vacation for the next week. Susan and I are going to drive down to Vancouver to visit some of her family and friends. I have plan to fit in a fun activity that relates (kind of) to council - if that pans out I'll have pics but other than that you can expect the blog to be pretty quiet until about the 13th.